ABUJA, Nigeria, Jun 19 2017 (IPS) - A genetic resource centre run by the Nigeria-based International Institute for Tropical Agriculture (IITA) has banked thousands of crop varieties for disaster relief and research, holds the world’s largest and most diverse collection of cowpeas, and contains some of Africa’s rarest insect species. In times of crises when farmers lose their seeds, the genetic resource centre – which the institute calls genebank – provides new seeds that are multiplied and given to farmers. Researchers can also pick from the bank preferred traits they incorporate into breeding programmes. For a continent plagued by perennial food shortages, and a world rapidly losing its genetic resources, the genebank is a precious gift, and its contents are kept in trust for humanity. “The IITA genebank is one of the most precious resource centres to Africa, in particular, and the world at large. I see it as the pride of Africa,” said Michael Abberton, the head of the IITA’s genetic resource centre. Since plant and animal genetic resources are the foundation of sustainable agriculture and global food security, conserving crop varieties helps prevent “genetic erosion”, said Abberton, referring to the tendency of losing varieties either as a result of the development of new varieties or disasters. The IITA’s conservation activities started in the mid-1970s with the establishment of a genebank to help in crop improvement. That bank was later upgraded to provide seeds for people affected by flood, fire, wars, and other disasters. The genebank currently holds over 28,000 accessions of plant material, called germplasm, of Africa’s major food crops – maize, plantain, cassava, cowpea, banana, yam, soybean, and bambara nut. The bank has some 15,122 unique samples of cowpeas that come from 88 countries, close to half of global cowpea diversity. Seed samples of IITA’s cowpea collections stored since 1978 are still viable. The crops’ germplasms are held in trust on behalf of humanity under the auspices of the United Nations, and distributed without restriction for use in research for food and agriculture, the institute says. Abberton said depending on the species of a product, and its reproductive and dissemination biology, collections are either stored in the field, or in the seed or in-vitro genebanks. All crops producing orthodox seeds are maintained at optimal water content and low temperatures of 5 ºC in short term, and -20 ºC in long term. At the research level, crops’ traits such as seed colour, resistance to pest and diseases, height of plant, sweetness or others can all be harnessed from the genebank. The IITA was the first centre to contribute to the new Svalbard Global Seed Vault project, built by the Norwegian government as a service to the global community. The facility is funded by the Rome-based NGO Global Crop Diversity Trust. In 2008, twenty-one boxes of IITA germplasm samples, part of a first installment, arrived in Oslo to go to the isolated Norwegian archipelago in time for its Feb. 26 opening. In 2009, another shipment was made. Seeds samples sent to Svalbard Global Seed Vault were large sample of cowpea (also known as black-eyed pea), wild vigna, soybean, maize and bambara. The IITA genebank based in Nigeria also plays a vital role as a reservoir for response to disaster. It did so on May 22 when the institute donated 35,930 kilograms of seeds to Nigeria’s Borno state government to cushion an eight-year humanitarian crisis caused by the Islamist group Boko Haram. Borno, in northeastern Nigeria, has been the epicentre of Boko Haram violence. The group is responsible for the deaths of more than 20,000 people and the displacement of more than 2 million – a majority of them farmers. The seeds donated to Borno government included improved varieties of cowpea, soybean, maize, millet, sorghum, and rice. They were adapted to the climate of the region with some being extra-early, early, and intermediate, maturing, IITA’s deputy director general for partnerships for delivery, Kenton Dashiell, explained. “They are also high yielding and resistant to the major pests and diseases, and other biotic and abiotic constraints in the region,” he said. 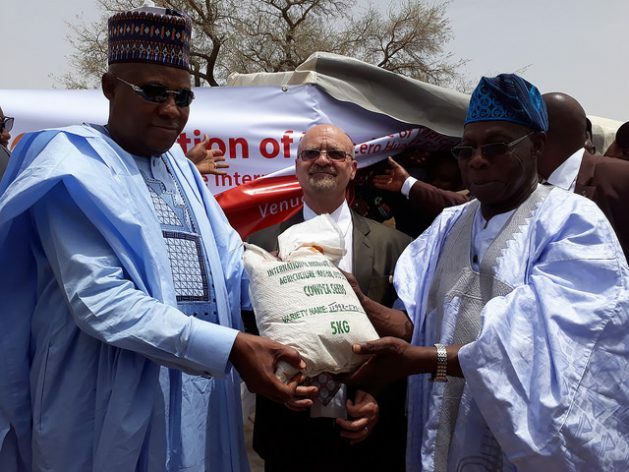 Former Nigerian president Olusegun Obasanjo, who as an IITA ambassador made the presentation on behalf of the institute, described the donation as the most meaningful gift ever given to the people of Borno. Abberton, the head of the genetic resource centre, told IPS the donations to Borno state would not have been possible if not for the genebank that helped the institute in conserving the seeds. “So, the genebank is a life wire for the IITA and humanity,” he said. He added that the IITA was committed to alleviating hunger and poverty in Sub-Saharan Africa.